Well, 2008 is over. I am very much looking forward to the new year. I know the outlooks is somewhat bleak, but I am grateful for a fresh start. I am resolving to move forward with optimism and enthusiasm. I did not spend that much time sewing. I found sewing to be tedious, time consuming and my failures where disappointing. I have realized 3 things about sewing: 1) it can be tedious and 2) it is a lot harder (compared to knitting) to fix mistakes, and 3) most patterns need alterations in order to fit (me) properly, so muslins are a must... even more so than a knit gauge swatch. 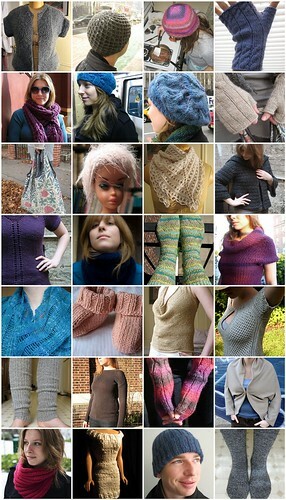 I am thrilled with my knitting output this past year, however I want to increase my sewing output. That is a resolution for 2009; to sew more & to get better at pattern alterations. Also, I am resolving to finish a project before I take on another. I tend to be quite fickle with my attentions because I have so many ideas that I want to try. So I will attempt to keep the number of WIPS consistent. I like to keep a lace shawl on the needles at all times, because for me it tends to be tedious and takes forever to finish. I work two rows and then find a mistake and have to rip back. Sigh. I want to learn how to sew this year, at the very least I would like to be able to line bags. Hey, you knit a lot! I know how to sew a little, and I'm thinking of getting a sewing machine, but the reasons that you cite are why I am hesitating. Plus knitting is portable!